Lomo saltado anyone? I feel like I haven’t written a blog in a minute…guess I have been too distracted eating all the amazing Peruvian food! Sophia left off in Guayaquil, Ecuador. 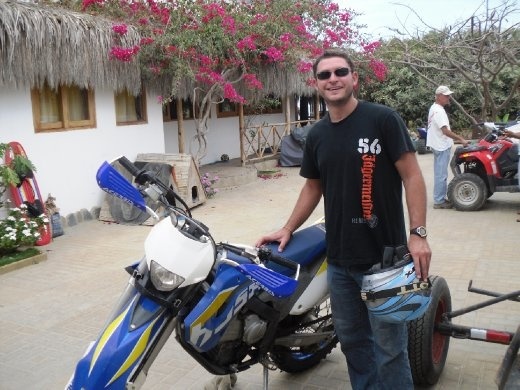 Which was great, all of Ecuador really was, from there, it was a relatively short ride to Mancora, Peru. Mancora in its own right has a lot to offer, especially to those who enjoy ocean. Although, we knowing little of the area, landed there to visit with Mario Ganoza, Sr. Father of my very good friend, Mario Ganoza in LA. We had never met and I wasn’t even sure if he would speak any English. 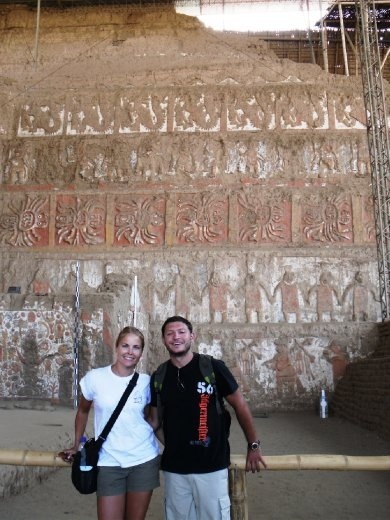 We both have been very excited about entering Peru in general, I had felt a connection to the area due to the continual praise I heard from Mario on a regular basis…I can say, that he was almost surprisingly accurate. Peru is an amazing country with so much to offer. We arrived in Mancora about 4hrs later than expected and around 9:30p we found a phone and called Mario Sr. Luckily for me, his English, although not perfect is certainly better than my Spanish. 10 minutes later he was picking us up and we were headed off for our first amazing Peruvian meal. Food is a very large part of their culture here and it shows. The food we have had has been definitely the best of any country we’ve visited. I’m sure it’s partially due to having locals to order for us, but not completely. The Ganoza’s really took amazing care of us during our visit, after dinner, we were headed to the neighboring town of Los Organos, were we had a room at the Takaynamo hotel (owned by Mario’s uncle, Manuel, or QT as everyone calls him.) The hotel is amazing, right on a quiet, surfing beach. The hotel is run primarily by his 2 daughters, one who handles the hotel and other the restaurant. Los Organos is a beautiful town with a more laid back atmosphere than the more popular neighbor of Mancora. Both have amazing waves, surf instructors, rentals and the sport of kite surfing is really taking off. On our last day in town the wind really picked up and we saw probably a dozen people out catching some really big air with their kite surfing set ups. 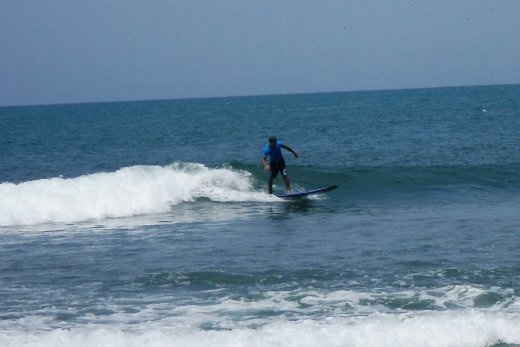 Speaking of surf, after crashing out at the Takaynamo, Mario Sr. arrived bright and early to take us surfing. The waves were a bit small in front the hotel so we headed to Mancora. We rented a couple long boards and we were off. I guess after all that time in Central America, we had gotten pretty used to the 80 degree Caribbean, so this took a minute to adjust. Sophia’s first attempt at a wave left her not so stoked about the rocks she found under the water…apparently we entered the water where the people who actually know what there doing go…lol. So she took a break while I went and paddled my life away. After many desperate attempts, I caught a few waves and was absolutely loving the rush of riding them in. Even so, Mario could tell that our skills were not up to snuff and recruited a friend of his to take us out for a lesson and man, what a difference. 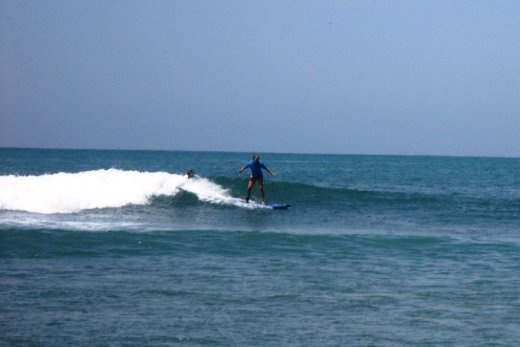 With her help, I was catching every wave I went for…it was awesome! But my arms and shoulders couldn’t take much more paddling so I caught my last wave in and traded out with Sophia, next thing I know, there she is catching waves, riding like a pro! We eventually all tuckered out and headed back to the hotel for nap time. About 5pm, Mario was back to take us out to see the area south of Los Organos. Tourism in the area is growing south down the coastline and Mario has secured, don’t want to throw his business out there, but let’s just say, a large stretch of beach front property between Organos and a town called Cabo Blanco. Cabo Blanco was, up until 20 some years ago, one of the sport fishing capitals of the world, we're talking marlin and tuna weighing over 1000lbs! Apparently is was also one of Ernest Hemingways favorite places to relax and write. As well as Marilyn Monroe was known to visit a local hotel from time to time. We watched the sunset and then headed back to town for dinner with the family. I could go on and on about this area, but there’s so much more to talk about. A big highlight for me though was renting a 450cc dirt bike (cost over $14K) and 4-wheeler for Sophia. She had never ridden before and really had fun. We cruised up and down the beach for a couple hours, it was great. If you see this, thanks again to Mario and everyone at Takaynamo hotel, the place is amazing, you guys are doing a great job! Our next stop was in Mario jr’s home town of Huanchaco. A beach, surfer town just outside of Trujillo. What an awesome time. Mario’s family has a house there in Huanchaco, that no one has been using for a minute and they were incredibly kind to let us stay there. For the first time over 4months, we slept in a house…so nice. Plus, it kinda made me feel like a local, or at least not as much of a tourist as everyone else staying in hostals. It also so happens that Mario’s uncle (the guys with the hotel in Los Organos) live in another beach town, next to Huanchaco. QT was great to us as well, we met up the morning after arriving and he took us all over Trujillo. First we visited his farm…of course I’ve been around farming (growing up in G-town), but I don’t think I ever knew anyone who actually had their own big farm. He is growing sugar cane and organic avocados mostly. With a little bit of other stuff here and there. From there we were off to see some Incan ruins, the Temple’s of the sun & the moon. The only excavation has been done of the moon temple. A pretty incredible pyramid like temple. Built with seven levels, 1 level per every hundred years. Done completely with adobe bricks. You see, most of northern and probably central peru, at least near the pacific coast is desert. Like crazy, never would have expected desert. So, the indigenous people made these bricks out the sand. Because when they would build a new level of the temple, they would bury the previous level, even the paint used on the walls has been preserved. For close to 2,000 years! 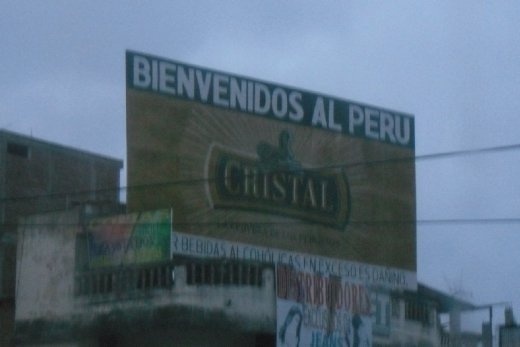 There are adobe ruins all over this part of Peru, but these were the only we saw. From there, QT took us to the country club that his Uncle founded. Very cool spot and not that expensive. I don’t what dues cost, but a caddy for 18holes is $4. And these caddy’s are like pro-level players. A 3 course lunch for $6, and of course all the amenities you would expect from a country club. Peru is quite nice in that way…like Giovanni (mario’s cousin) put it, you don’t have to rich to have rich person luxuries in Peru. It’s common to have things like a live in maid. From what I understand, new home construction will run you around $100/ sq meter (9 sq. ft. if my math is right), a fraction of what it costs in the states. And while I’m on the subject, from what I’ve heard Peru is seeing economic growth of close to 10% year right now. Not bad. So, this blog is getting bit long for my taste, so I’m gonna wrap it up. But QT, if you see this, thanks for everything…we really had a blast. 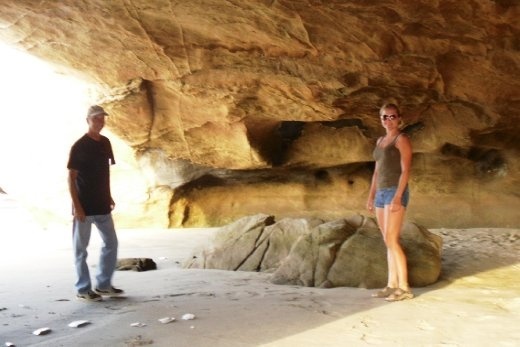 Our 3 nights in Huanchaco were nice…I do kinda regret not doing more surfing there, but what can you do. So, there you have Northern Peru. Next up from Sophia…Lima, Cuzco and ……………..Machu Picchu! OMG!! Every blog I read gets better and better! You guys....I am spokeless as your father says. I think Peru could be our retirement destination... or Panama... or Ecuador..you (along with International Living magazine) have really made us think.. Thank you really for helping me by answering my few problems whose solutions I was looking for such a long time.